The curve of the animal's forehead and the dent of an ear also appear in a new photo taken by the High Resolution Imaging Science Experiment (HiRISE) on NASA's Mars Reconnaissance Orbiter. 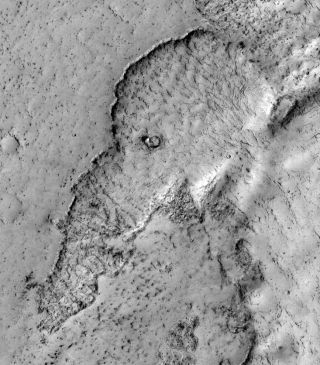 "This is a good example of the phenomena 'pareidolia,' where we see things (such as animals) that aren't really there," University of Arizona planetary geologist Alfred McEwen wrote in an update posted on the university's HiRISE website. Scientists aren't sure if the lava flows on Mars were deposited quickly, or over a longer time period, as is the case on Earth, where most lava floods were put in place over years to decades. "This is probably true for much of the lava on Mars as well," McEwen wrote. "An elephant can walk away from the slowly advancing flow front. However, there is also evidence for much more rapidly flowing lava on Mars, a true flood of lava. In this instance, maybe this elephant couldn't run away fast enough."